This article wasn't approved by the admins, so it would normally only be available to TotalFark subscribers. However, this link is so good that we're letting you see it. Posting new comments is still only available to TotalFark subscribers. If you are a paid TotalFark subscriber, you must have cookies enabled in your browser. You can reset your cookie by logging in. First off, brilliant headline. I hope this isn't a repeat. Second off...well, duh they don't taste as good when they're not Yellow #6...your senses work together to create a complex impression of every thing that you experience. As long as they don't come for Black #1, I'm cool. Uncle Wiggly: As long as they don't come for Black #1, I'm cool. jaylectricity: well, duh they don't taste as good when they're not Yellow #6...your senses work together to create a complex impression of every thing that you experience. Keep away from my Blue 5. I love giving a bunch of it to my friends on St. Patrick's day and hearing what happens later on in the day. Nothing wrong with red 40, unless you're Jewish. They tend to now call it "carmine extract" on labels now, to get Away from the synthetic sounding name. It's just bug juice. There's another red food dye, forget what they call it in food, I know it as lac. Also a bug extract. I'd trust the bug extracts more than some of the crazy synthetics. As someone who is sensitive to red 40, goddammit so much. They put it in freaking everything, from cheerios to biscuits to apple juice. Even things that aren't even red. And in products I've been buying for years wherein they've just started adding it in, for no apparent reason, so I have a reaction and scream out "when then hell did they start putting red 40 in THIS? ", and only that tin has red 40 in the ingredients, but none of the other tins' ingredient lists of allegedly precisely the same thing. And I keep running into it when I go out to eat, too to the point where I frequently question going out to eat at all. GHGHGHGHGHH! There are other artificial colors out there that do exactly the same thing; they're just marginally more expensive. But these are the same people buying lead toys from China, so who cares about our kids' brains? Why the fark do we need any of these again? Oh yeah- if we didn't use them, the larger populace would realize that what we eat is not produced from the natural ingredients supposed at all, but reprocessed corn flavored to taste like those natural things. \This post brought to you by Kraft Guacamole. \\Now with 100% less avocados! \\\Yes, it exists. Or did. LincolnLogolas: Nothing wrong with red 40, unless you're Jewish. They tend to now call it "carmine extract" on labels now, to get Away from the synthetic sounding name. It's just bug juice. There's another red food dye, forget what they call it in food, I know it as lac. Also a bug extract. I'd trust the bug extracts more than some of the crazy synthetics. Red 40 is the synthetic stuff, formerly made from coal tar and now made from petroleum. Carmine is labeled simply as carmine, or as natural red 40, and it's a fair bit safer then most of the crap we pump into things. It also has a long, illustrious, and fascinating history. Pick up the book "A Perfect Red". Sim Tree: As someone who is sensitive to red 40, goddammit so much. They put it in freaking everything, from cheerios to biscuits to apple juice. Even things that aren't even red. And in products I've been buying for years wherein they've just started adding it in, for no apparent reason, so I have a reaction and scream out "when then hell did they start putting red 40 in THIS? ", and only that tin has red 40 in the ingredients, but none of the other tins' ingredient lists of allegedly precisely the same thing. And I keep running into it when I go out to eat, too to the point where I frequently question going out to eat at all. GHGHGHGHGHH! They should use a marginally more expensive artificial coloring because you are allergic? I prefer all my food gray and colorless. Like in The Matrix. Won't someone think of the children? cptjeff: LincolnLogolas: Nothing wrong with red 40, unless you're Jewish. They tend to now call it "carmine extract" on labels now, to get Away from the synthetic sounding name. It's just bug juice. There's another red food dye, forget what they call it in food, I know it as lac. Also a bug extract. I'd trust the bug extracts more than some of the crazy synthetics. Sorry, that should be "natural red 4", not natural red 40.
this is brilliant marketing. get rid of the artificial color and save money PLUS charge more because the label says organic. i tend to doubt just how "organic" most products with that label really are. I'm honestly ok with the removal of a lot of food colourings. I don't really know why, but some of that stuff really screws certain people up. I used to have a neighbour whose kid would be literally bouncing off the walls, or thrashing around screaming at the top of his lungs, if he had any red no6. Speaking of which, if anybody needs to make a drug that induces assholery, I know just the chemical. err, red 40 I think it was actually. jaylectricity: Uncle Wiggly: As long as they don't come for Black #1, I'm cool. Will Haunt the s#@t out of them if they so much think about it! This is insane. If 'natural' products were subjected to the same standards as 'artificial' ones, bread, milk and potatoes would be classified as deadly poisons. forteblast: Uncle Wiggly: As long as they don't come for Black #1, I'm cool. courteous and "pleasant" manner ..."
be closed until further notice." a temperate or "pleasant" nature." for inclement weather of any kind." I prefer tumeric, parsley, and paprika as my coloring agents. / Seriously... Tumeric will turn you and everything you love yellow. Gigantos: Keep away from my Blue 5. I love giving a bunch of it to my friends on St. Patrick's day and hearing what happens later on in the day. I hope I have a kindred spirit. I used to manage big chain stores. I won't mention the name, but it rhymes with Hall*Fart. I was walking the bakery one morning and the bakery manager wondered out loud if drinking straight shots of that dye they used in icing would affect your urine color. I drank blue, he did red. No difference in color to our pee, even hours later. Sad face. But the next morning, after I had even forgotten about it, I produced the brightest green excrement in the history of man. I made my now ex-wife look at it. And even though she is a tightass about that kind of thing, she broke out laughing and asked me what the hell I was thinking. Every time I eat the nachos at Damon's, my poop turns green. I thought they used to color some stuff with the blood of virgins. blackheart666: forteblast: Uncle Wiggly: As long as they don't come for Black #1, I'm cool. I know that look on Michelle's face. I'm guessing I know which half. nobodyUwannaknow: I thought they used to color some stuff with the blood of virgins. That Guy in the Dos Equis Commercials: Gigantos: Keep away from my Blue 5. I love giving a bunch of it to my friends on St. Patrick's day and hearing what happens later on in the day. Why wasn't there any mention of sugar content in the article? Seems like food marketed to kids with lots of dye in it will be loaded with sugar as well. 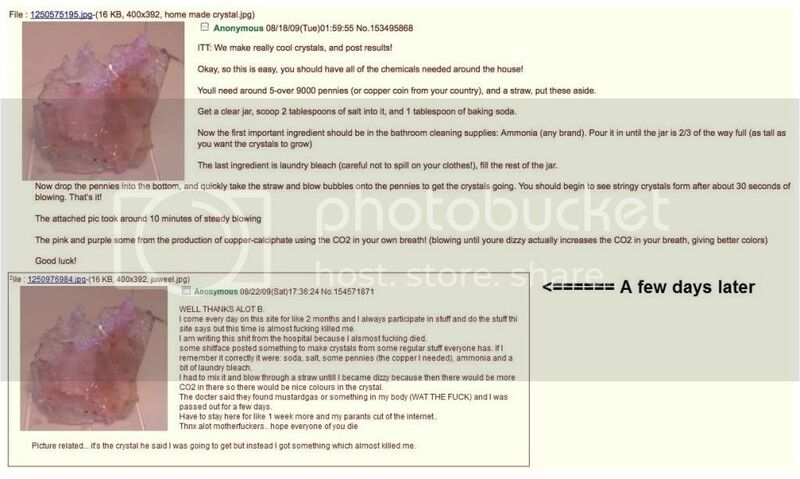 The linked article says the mom completely removed artificial dye from her kids diet and he really calmed down but didn't say how. If she just got rid of all the sugar loaded junk food, well duh. They also mention it's for kids who already have behavior disorders, so I'm guessing after this they'll start working on banning cartoons because it makes the little prince violent. jst3p: Sim Tree: As someone who is sensitive to red 40, goddammit so much. They put it in freaking everything, from cheerios to biscuits to apple juice. Even things that aren't even red. And in products I've been buying for years wherein they've just started adding it in, for no apparent reason, so I have a reaction and scream out "when then hell did they start putting red 40 in THIS? ", and only that tin has red 40 in the ingredients, but none of the other tins' ingredient lists of allegedly precisely the same thing. And I keep running into it when I go out to eat, too to the point where I frequently question going out to eat at all. GHGHGHGHGHH! It's not just me, but a whole class of people, and possibly most of the children on the entire planet, but the side effects are subtle, and slow to onset, so are mostly ignored. Nevermind that several other industrialized nations have banned red 40 outright, and we can't even get an allergy warning in the corner. Sorry it's just the article has got on my bad side; it's a prime example of "did not do the research"; they merely took an obviously biased press release and rewrote it as an article, saying that color adds value to foods. Well yes, but there are other colors that aren't actually poisonous, which could be equally valuable in foods, which the article itself completely ignores! As if any food that was not absolutely neon hot pink would be no good; which is why all our food today looks similar to 'froot-roll-ups'. It's madness! (Sparta). Then at the end, instead of approaching this argument using any logic whatsoever, they only quote people saying 'Well, if we hadn't started using red 40 sprinkles, it wouldn't be a cupcake'. If they'd quoted someone saying 'well, we used to have a wheelchair ramp, but we took it out so the front looks pretty' they'd have his head on a platter! Yet they've effectively banned an equal portion of their potential customers, and then stand around saying "duh", wondering why their sales suddenly drop. GranoblasticMan: Pics or it didn't happen. This was pre-Blackberry days, or else there would be ample documentation. You owe it to yourself. Down two ounces of blue food dye, and let the game come to you. That Guy in the Dos Equis Commercials: GranoblasticMan: Pics or it didn't happen. First time it happened to me was when I was a kid and had a Black Cherry Slushie at BK. I remember going to the bathroom that night, and then thinking I had to go to the hospital. I was pretty freaked out. Oh no thank you. I've been around long enough to know not to do something someone told me on the internet (new window). FFS, is there any way to get the damn scare crows at "The Center for Science in the Public Interest", to shut the hell up and leave us the fark alone! WI241TH: Why wasn't there any mention of sugar content in the article? Seems like food marketed to kids with lots of dye in it will be loaded with sugar as well. The linked article says the mom completely removed artificial dye from her kids diet and he really calmed down but didn't say how. If she just got rid of all the sugar loaded junk food, well duh. They also mention it's for kids who already have behavior disorders, so I'm guessing after this they'll start working on banning cartoons because it makes the little prince violent. My brother had an allergy to Sunset Yellow and Tartrazineand they would send him absolutely mental. Yes, he was a problem child anyway and it wasn't the only trigger, *but* if you gave him green candy instead of yellow/orange candy he was fine. You could pack him to the eyeballs with sugar, and yes he'd get a bit hyper, but it was nothing like the running-screaming-crying-shouting-jumping-bawling monster he'd turn into given something with sunset yellow or tartrazine in it. So these things do happen. I'm not going to get into any sort of natural/artifical debate, but sometimes these colours do do things over and above "being a kid"
Or we could just start eating real food, and that includes snack food, rather than just lying to ourselves about all these dyes and scary sounding additives being perfectly safe to eat. Because they would never put anything in food that might cause health problems right? What we need more than banning food coloring are parents who are smart enough to decide that a product with items on an ingredient list like Red 40 or brominated soybean oil might not be the best thing to eat. Red Velvet cupcakes are typically colored with massive amounts of red dye while there are perfectly harmless sources of color like beets or strawberries, yet no one has a problem with this? I don't eat anything with dyes or strange additives anymore(to my knowledge) and I don't think I'm missing out on taste at all. As far as the taste issue, it seems that everyone has burned out their taste buds on all that highly processed snack food so they don't have any chemical taste sensation left - it's all psychological now. Once you actually start eliminating this crap from your diet you start to taste food as it is and you don't need a long list of awful sounding ingredients for snack food that tastes good. Here's a thought - if something that is supposedly created from food that does have color, like corn and cheese, turns out GRAY without food coloring, do you really think you should be eating it? I want to talk about pickles for a minute. I used to work at Steinfeld's and man-o'-man did the blanching process make some of those cukes look like larvae. They would come out milky green/grey and limp, really unappealing in so many ways. The smell was atrocious, but that's another story. It amazed me that once you added the brine and let them sit they'd magically change from what looked like a giant maggot, to something that people actually wanted to eat. WI241TH: Why wasn't there any mention of sugar content in the article? Seems like food marketed to kids with lots of dye in it will be loaded with sugar as well. The linked article says the mom completely removed artificial dye from her kids diet and he really calmed down but didn't say how. If she just got rid of all the sugar loaded junk food, well duh. Probably because there is very little empirical evidence that sugar causes hyperactivity, ESPECIALLY in children with ADHD (but MUCH evidence that any perceived change in behaviour is due to the EXPECTATION that sugar will cause hyperactivity). Gigantos: That Guy in the Dos Equis Commercials: GranoblasticMan: Pics or it didn't happen. The guy who drank the red fired off a Pringle's can that was jet black, which seems to be a sure sign of imminent death. He ran around like a retard on pudding day until he remembered what we had done. I feel for you. I'm sensitive to Yellow 5 and Yellow 6, and suspect but haven't confirmed a sensitivity to Red 40. I forgot to check my burger for pickles last week and swallowed a corner off a pickle slice before I saw it. Ruined my whole afternoon. Headache and confusion mostly. If I had eaten more, it would have given me a full blown migraine. jingks: jaylectricity: well, duh they don't taste as good when they're not Yellow #6...your senses work together to create a complex impression of every thing that you experience. I'm not going to Google that, learned my lesson the first time, what has been seen etc.